Two years ago, the small Hungarian town of Ajka was pummeled with 35 million cubic meters of toxic sludge when a nearby alumina plant reservoir burst. The red-orange mud flowed through the town streets, with waves reaching over six feet high. It took nearly a week to contain the spill that eventually killed 10 people and destroyed countless houses, schools, businesses, and farms. Spanish Artist Palindromo Meszaros recently travelled to the ravaged town and captured some unbelievable images in his latest photo collection titled "The Line." “The Line” exposes the irreparable damage the toxic sludge left on the small town. A thick line of red swallows up trees, dyes the town’s dirt and grass, and brands the bottom half of homes and buildings for as far as the eye can see. Mesarzaro creates these images by only lining up the tip of the red stains with the horizon line in each photograph making the result is so precise and vibrant, it looks as if someone had purposely painted the town red. Though the images are striking, they are a constant reminder of the mark toxic waste has left on the town of Ajka and the continued need and effort to rebuild from the red rubble. Known for his documentary style of photography, Meszaros has created carefully orchestrated images of other Eastern European ecosystems and atmospheres, focusing on social and anthropological issues. His background in architecture is also key to his unique style, building mesmerizing images that tell a captivating, oftentimes overlooked story. 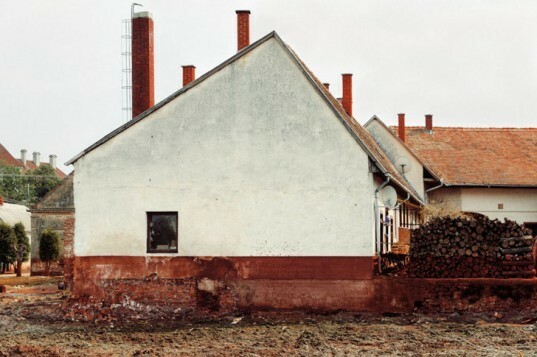 He was so moved by the town of Ajka, he produced a second series of photographs, “The Line II,” exploring the lifestyle and landscape of the remaining industrial community. The Line" exposes the irrecoverable damage the toxic sludge left on the small town. 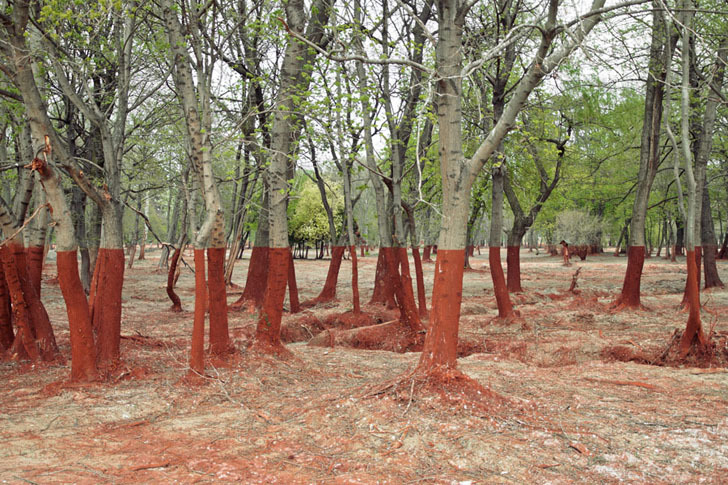 A thick line of red swallows up trees and dyes the town's dirt and grass. The streak brands the bottom half of homes and buildings for as far as the eye can see. Mesarzaro creates these images by only lining up the tip of the red stains with the horizon line in each photograph. The result is so precise and vibrant, it looks as if someone had purposely painted the town red. Though the images are striking, they are a constant reminder of the mark toxic waste has left on the town of Ajka and the continued need and effort to rebuild from the red rubble. nown for his documentary style of photography, Meszaros has created carefully orchestrated images of other Eastern European ecosystems. His work focuses on social and anthropological issues throughout these countries. His background in architecture is also key to his unique style. His keen eye effortlessly makes each building a part of the landscape. Cleaning the spill is estimated to cost over $10 million. Meszaros created a second series of the town called "The Line II," exploring the lifestyles and lanscape of the remaining industrial town. His mesmerizing images tell a captivating, oftentimes overlooked story.